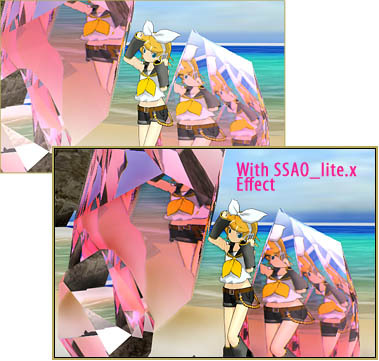 Where can I download the Quartz Effect for MikuMikuDance? How do I use the MME Quartz Effect in my MMD animation? How can I add sparkling jewels into my MMD scene? 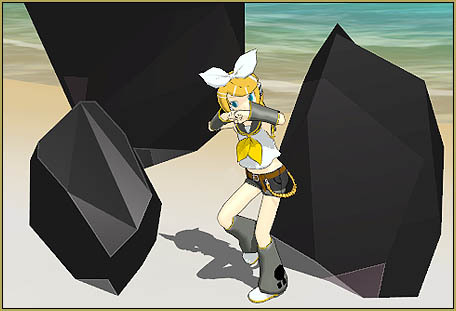 for MikuMikuDance are just a few clicks away! I found this effect, or at least the link to it, while writing my Rhinestone Effect tutorial… it’s on the same Effects Page as Rhinestone. You will have to go through the same steps to download as you see in that Rhinestone tutorial. 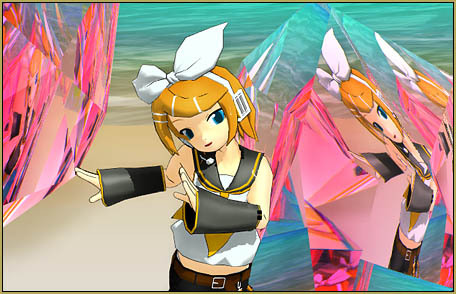 The big stones behind Rin are the Normal version of Quartz Effect (I enlarged them to Si size of 2 and an Si of 3)… and that smaller stone is the Simple version at Si of 1, full size. Turn them into clear, sparkling quartz crystals! Go to the Background tab (at the top of the MMD screen) and choose one of the Screen Capture Modes, 1 or 2. … INSTANTLY your bits of coal become crystals! You can size the quartz effect crystals way-down to diamond jewel size… like an Si setting of .06 or .oo8… and when you do, they still sparkle but, since they rely on the colors and details around them, they will need your full attention as you get the lighting and the models positioned so as to see the jewels sparkle with colorful reflections. 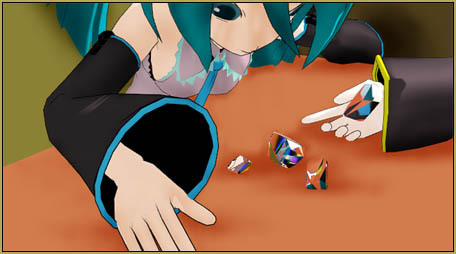 … without Miku in that scene, the quartz crystals have no reflection other than the color of the table. The crystals were much more colorful when I added the MME Effcet SSAO_Lite. … The regular SSAO made the surrounding shadows a bit darker than I liked… so I went with the Lite version. The README for this effect alluded to how you need to use the Screen Capture mode in the Background list… but didn’t say much else. I DID check the actual quartz.FX file to see what might be edited/adjusted in there… and there looks to be PLENTY of entries that you might adjust. I translated that .fx file into English using Google Translate and got this text file for you to download. Use that text file only for reference as you see which values you might want to change… then open the ACTUAL original .fx file in a text editor, like Notebook++, and edit as you wish. I studied that text file to see if I might change that PINK hue into some other color… I gave only a quick look but did not see which values to adjust… I will dig-in more deeply, later. CREDITS: That’s the basic Animasa Rin_Kagamene_act2 … the MMD Batokin Island stage… the Quartz effect… a little of the Miku Ievan Polkka… and the SSAO_Lite effect for a bit of richer color-tones. Have fun with the Quartz Effect! So is there any possible way to change how strong this reflection is? it doesn’t really look nice to me and I’d like to change it, thank you! As far as I can tell, there’s no way to make it “more” transparent, as transparency is not implemented here at all. I don’t know what Burenai ai de is, but I suspect it uses some different kind of effect. look at the stage on 1:28 this is what i meant. OK, I stand corrected. I *still* don’t know what crystals were used in the video you refer to, but Quartz effect *can* be made transparent simply by adjusting Tr parameter of the crystal object in the Accessory Manipulation panel. No effect editing is necessary (although you’ll have to adjust each crystal separately).